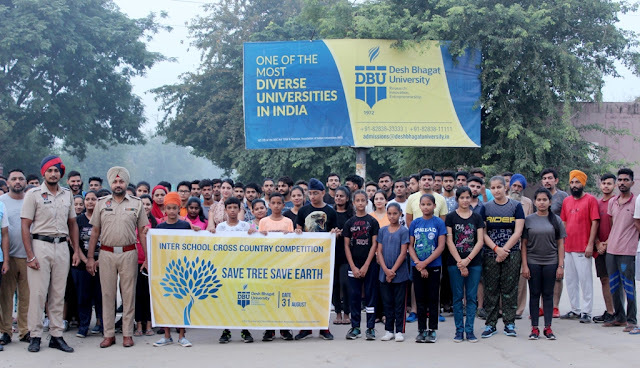 In best university in Punjab, Desh Bhagat University organized inter school cross country competition based on the theme “Save Tree Save Earth”. The objective of the event was to create awareness in public regarding protection of environment. The race began early in the morning as Vice Chancellor Dr. Virinder Singh flagged it off. Students from different faculties of the university took part in it with full enthusiasm. The race started from the university and finished back to the University. The competition was tough but it was a source of great awareness and inspiration for the students. In boy's category, Yograj Singh student of BA second year, was the first to cross the finishing line followed by Sukhdev Singh who was placed second. Both were from Faculty of Education. From DAMS Divya stood first, Neha stood second. University Chancellor Dr. Zora Singh was presiding over the prize distribution function of the Cross Country Race organized by DeshBhagat University. He encouraged all the students to take part in sports event regularly rather than wasting time on internet or other useless things. He also said that the University is provides all types of facilities for all the major indoor and outdoor games to its students so, that they are able to attain the desired heights in the field of sports. The event was held under the supervision of sports coordinator and Coach Nandan Singh.